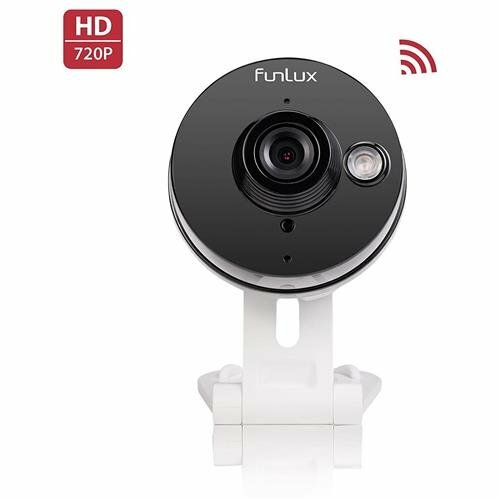 Funlux Wireless IP Camera, a compact yet sophisticated home monitoring solution, that is able to keep track of the people and places you care about most in HD. Whether you're using a smartphone, tablet, or computer, a click or two is all you'll ever need to check in. Super Easy Setup: turn on the camera and follow the steps to get it connected easily in minutes. Stay Connected with yours when you are away, and get motion or sound alerts right on your smartphone, no matter where you are, so that you never miss a moment. With Two-Way Audio, this mini camera gives you the ability to listen and talk to your children and give the babysitter last-minute instructions. Simple but with Great Basic Features: 115° Wide Angle to see more, Up to 30ft Night Vision, Share devices with your family and friends, Unobtrusive and Flexible Placement. Connectivity: IP/Network-2.4GHz Wireless (Note: please connect your phone to the 2.4 GHz network if your router provides both 2.4 GHz and 5 GHz network). Package includes: (1) 720P HD Wireless Camera, (1) Power Supply for Camera and (1) Quick Guide. If you have any questions about this product by Funlux, contact us by completing and submitting the form below. If you are looking for a specif part number, please include it with your message.